Plastor, leading UK supplier of plastic containers and storage equipment is proudly returning to the Showman’s Show, all be it in a new location for 2018. Moving to Avenue C, stand 184, the company is set to exhibit a highly relevant selection of heavy duty plastic containers perfect for all events related industries, including catering, tableware and marquee providers; as well as audio, visual and lighting companies. Plastor is offering Showman’s Show visitors an incredible opportunity not to be missed! To celebrate the success of Plastor’s new and improved 80 Litre plastic crates (Model No. 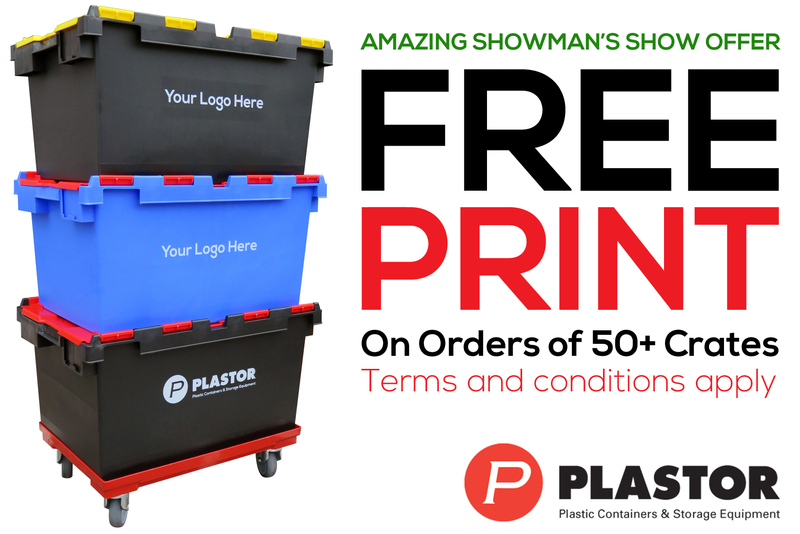 : LC3-P) Plastor is offering Showman’s Show visitors the chance of free printing, including set-up costs, on orders of 50+ attached lid containers from a selected range of very popular plastic crate models, including the new and popular LC3-P (710 x 460 x 368mm/80 Litre). In addition, Plastor will be previewing its new range of 800x600mm stacking containers in five popular heights (120, 175, 220, 320 & 420mm), some of which are available with open ends for easy picking access, this feature is especially useful when stacked or on shelving. They can also be provided with wheels, feet and runners for fork lift and pallet truck entry for easy transportation. The containers are ideal for large items, fixings, seat pads and linings. They are also a good solution for storing and transporting lights and electrical equipment, such as cabling. Also on display will be its range of glass dividers, in a number of popular glass sizes, ideal for caterers and tableware suppliers and the popular grey stacking containers are now available with clear drop on and hinged lids (cases), allowing contents to be swiftly identified. If that wasn’t enough the company is inviting visitors to the stand the opportunity to enter a prize draw to win a fantastic hamper full of goodies.